Today, Disney's 11th theme park, fifth "Magic Kingdom" style park, celebrates its second anniversary. 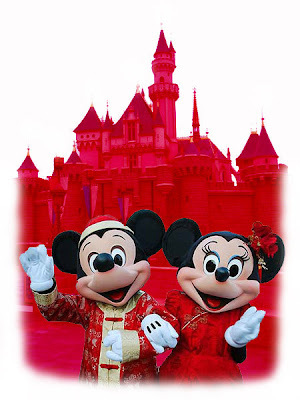 Hong Kong Disneyland was opened on this day on Penny's Bay, Lantau Island. While the smallest "Magic Kingdom" style park, HKDL is richly layered in great detail(unlike DCA), Disney paid close attention to Chinese culture, customs, and traditions when building Hong Kong Disneyland Resort and followed the rules of Feng Shui in much of the park's construction so as to give the park good luck. It didn't work, unfortunately. More so because of the lack of many E-Ticket rides than anything to do with Feng Shui. Three rides every traditional Disney theme parks has were left for future expansion... Pirates of the Caribbean, Haunted Mansion and It's A Small World were not there on opening day. The park just barely missed its first year projection of 5.5 million guest. One of those missing three, IASW will open up in early 2008. Truth be told, it should have opened up with at least two of the three... if not all three. The Curse of EuroDisney strikes again... When the park was proposed there were at least five lands, but due to budget cutbacks "Frontierland" was scuttled. We should start to see a lot more activity next year... expect some major announcement during and around the time "Small World" opens up. Anyway, happy birthday Hong Kong Disneyland! Here's to a bright future. And yes, there is a Blue Sky Alert planned for HKDL, but it won't be before late September/early October... so you'll have to suffer till then. Never fear, the future is bright, if not a little slow... but still bright! Just returning from 3 days at Hong Kong Disneyland I total agree with you. I spent two days long then I should have. Its a one day Park if that. I call it Disney Basic. They need more E ticket rides. They have plenty of room. Just returned from HK Disney and I'm never going again. The staff were fine but when I tried speaking to some of the managers they were snobby and could not be bothered to even smile. Obviously unaware of what customer service is all about. They should learn from the real Disneyland in US instead of claiming to be the best!